Tombstones are placed at the head of a grave to identify the person who is buried there. One local cemetery is getting a tombstone that identifies it with the highest honor a cemetery can receive. The Riesing Cemetery, located on Richter Road off Hwy. 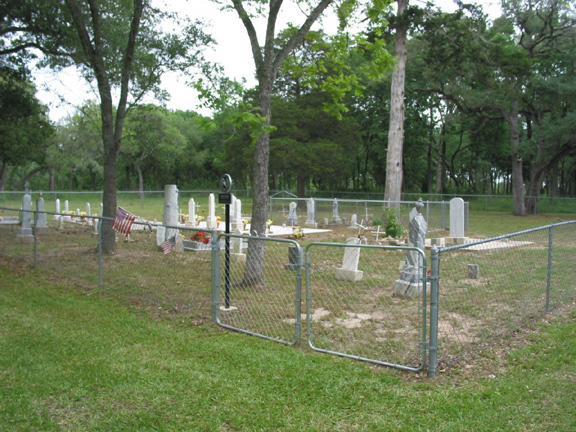 71 approximately 7 miles from Columbus, was recently designated a Texas Historical Cemetery. Families have been created, and children have left their markings in this world, and your presence today is a tribute to all those people buried here, he said to those in attendance. The dedication would not have been possible if it weren't for the help of the volunteers who helped clean the place. With the help of the county, they were able to straighten out the road leading to the cemetery, put in a road in order for a funeral car to drive all the way around, set up a parking lot system, fenced in the graveyard and cleared out a lot of the trees and weeds in the area. It was a jungle out here, and unless you were here 50 years ago, you don't know what it was like, said Angela Genzer Kretzschmar, who was responsible for getting the designation. Kretschmar's great-great-grandparents, William and Marie Bergmann Schmidt, started the cemetery in 1872. The oldest known grave belonged to Friedrich Johann Schmidt, who died in 1872. Born in 1808, he also has the earliest known year of birth of all the burials. His great-great-granddaughter, Willie Ann McColloch, was present to unveil the historical marker. Kretschmar tried for two years to tie the two Schmidt families together but was unsuccessful. Since then, several more families have been buried in the cemetery including members of the Riesing, Schobel, Hayek, Staffeildt, Hillebrand, Horndt, Koch, Karstech, Poenitzsch, Chollett and Dietrich families. Many of the families were related by blood or marriage. The cemetery holds approximately 50 known graves in the cemetery, including 13 children's graves. There are also several unmarked graves, lined with bricks and no tombstones. The refurbishing of the cemetery is the link to the past, Colorado County Judge Al Jamison said. Kretschmar said she hopes the reunion would bring some descendents to form an association to maintain the cemetery.